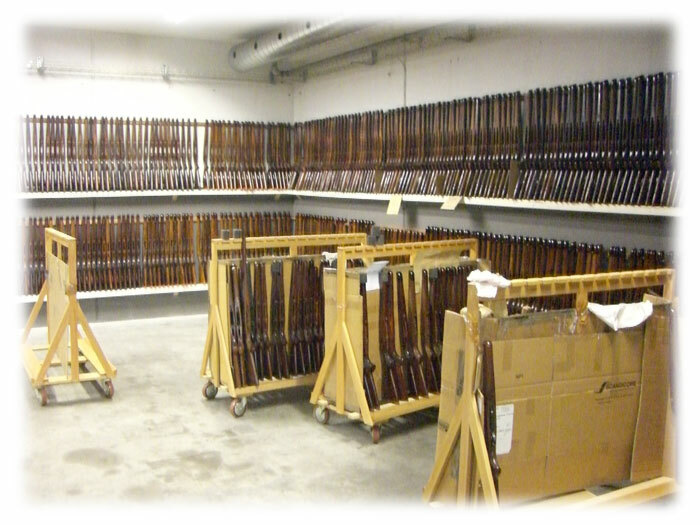 Schultz & Larsen rifle stocks are made from properly seasoned walnut heartwood. The walnut blanks, American walnut for the standard grades, Caucasian walnut for the higher grades, are transformed into finished stocks by very sophisticated CNC machinery that not only shapes the stock but cuts the chequering at the same time. The chequering is not laser cut as this produces vertical sided diamonds that break off easily. The Schultz & Larsen chequering is cut with a 45-degree cutter to provide perfect pyramids, the strongest and hardest wearing chequer pattern. After a light sanding the finishing process begins. Linseed oil is used and thin coats are applied to the wood, sealing the grain against any moisture. No stains or varnishes are used, just linseed oil in the traditional way. Linseed oil takes time to dry and that is why Schultz & Larsen have a stock storage room full of finished stocks stacked floor to ceiling, waiting quietly for the finish to develop. It is true to say that sometimes the finish on a new rifle may feel a little tacky, and perhaps there will be a little linseed oil on the sides of the pad. This is a cause for celebration because it shows, beyond question, that the traditional methods have been used, giving the owner a stock that will only require a little linseed oil rubbed in from time to time to maintain its beauty. No worries about synthetic finishes flaking off or scratching with use. An oil finished stock is easy to repair and just looks better and better with time and use. Finally, every stock is pillar bedded. Bedding increases accuracy by relieving stress on the action. Without bedding, the rifle's action is unlikely to sit flush in the stock, allowing the action to flex when the stock bolts are tightened. This flexing results in a loss of accuracy. Pillar bedding creates a consistent location for the action and prevents the wood compressing when the action bolts are tightened. At the same time, bedding prevents movement of the action in the stock, enhancing the ability to maintain zero. Wood grades run from Standard to Exhibition so if wood is your passion you can be sure there is a stock to suit your taste. The standard grade is an excellent, strong piece of wood with a nice colour and more figure than you might expect. The Schultz & Larsen stocks are made as good as a stock can be made without compromising quality. A question often asked is why do Schultz & Larsen not offer a synthetic stock? When customers think of a synthetic stock, they have in mind that it is less expensive, light weight and unbreakable. A cheap synthetic stock is all of those things but does nothing for the accuracy of the rifle. To shoot well the action must have a stable platform and cheap light synthetic stocks are not stable. A good stable synthetic is not cheap, costing much more than a wooden stock. It is not light either and typically will be at least 50% heavier than an equivalent profile wooden version. The problem is that most look at a plastic stock and assume it has all the benefits of a really good synthetic composite. It does not and the real disappointment comes when you shoot it. Schultz & Larsen will offer a synthetic stock once they have one that meets their requirements at a cost acceptable to their customers.